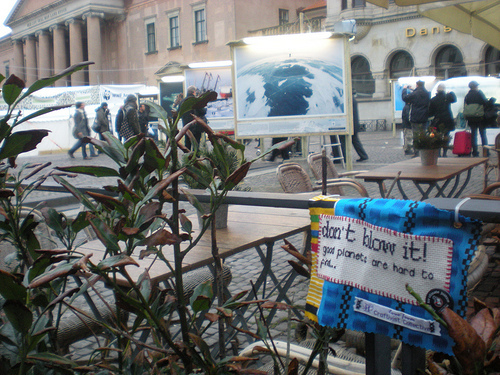 The ?Craftivist Collective and other climate change activists from all over the world went to Copenhagen, Denmark to tell World Leaders that they need to come up with a fair and binding climate change deal that supports the poorest people in the world now and in the future. Some members of the Craftivist Collective went on 2 coaches with Christian Aid supporters and travelled for 18 hours to get their. We were asked to sell Mini Protest Banner Kits on the coaches for £3 to raise money for Christian Aid partners. Most people wore their finished banners on their bags. A few were hung up, some were taken home to hang up and some were bought as Christmas presents.